Addiko Bank’s South Eastern Europe (SEE) region (Bosnia and Herzegovina, Croatia, Montenegro, Serbia and Slovenia) is in the midst of a fairly pronounced cyclical upswing, helped by catch-up effects owing to a generally very poor post-crisis growth performance. We believe however that the peak has already passed for most countries, with a weakening of external conditions (especially in the euro area) presenting big headwinds to growth. Growth rates should remain positive in the medium term, in the range of around 2.5%-4%. Croatia will be the weakest performer, with Slovenia and Bosnia doing best. Convergence with Western Europe should continue, although the pace is likely to slow during the 2020s. The region is quite diverse in terms of the banking sector performance. Banking sectors in Croatia and Slovenia are growing rather slowly, lagging behind their peers in Central Europe and even many countries in the euro area, while in Bosnia and Herzegovina, Serbia, and in particular Montenegro banking sectors are much more dynamic. Non-secured retail loans account for the bulk of loans to households in all the countries, and their share in total loans significantly exceeds the average level for the Eurozone. Slovenia is the leader in terms of digital transformation in the region, in particular when it comes to business digitalisation. Croatia so far significantly lags behind Slovenia, still it performs better than most countries of CEE. The other three countries in the region have not advanced much in digital transformation yet. The region’s financial markets in general and the retail household loan market segment are expected to grow in the long run consistent with the macroeconomic fundamentals of the countries. 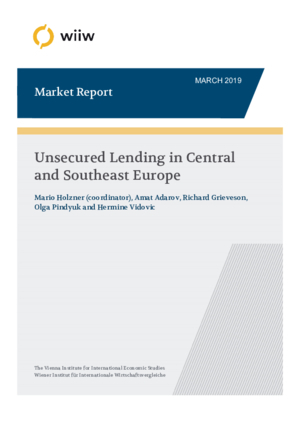 Under the most likely scenario, by the year 2047 the size of unsecured household loans will increase up to 21.4 bn EUR in Serbia, 19.6 bn EUR in Croatia, 14.0 bn EUR in Slovenia, 8.7 bn EUR in Bosnia and Herzegovina and 2.1 bn in Montenegro. This signifies a marked increase in the size of the market in nominal terms. On average the market is expected to triple over a period of three decades. Over the medium term we expect the markets to grow to levels of 6.9 bn EUR in Serbia, 10.8 bn EUR in Croatia, 5.2 bn EUR in Slovenia, 4.4 bn EUR in Bosnia and Herzegovina and 1 bn EUR in Montenegro, by 2023. This is on average about 20% higher compared to current 2018 levels.